Of the 117 million or so households in the United States, more than 100 million of them lacked any kind of smart device in 2016, including smart thermostats, sensors and other gadgets meant to make homes more energy-smart and grid-responsive. That's according to the latest findings from Parks Research. That’s either a sign of the smart home’s lack of development, or a measure of its potential. By 2020, more than 40 million households will have a smart thermostat, the firm predicted. Smart thermostats have been the main gateway for utilities and third-party energy services companies seeking to study and control residential load. Customers are looking for comfort and convenience, but welcome the energy savings when they’re put in front of them. Companies like Nest, Honeywell, ecobee, Alarm.com and many others are installing and maintaining networks in the millions of units, and tapping tens of thousands of them for demand response or time-of-use pricing. Lighting is the second-largest energy consumer in homes behind HVAC, and the report predicts that nearly 50 million homes will have at least some smart light bulbs by 2020, which makes it easier to turn lights on and off to save energy, as well as scare away burglars. More than 12 million U.S. households will have a smart water leak detector, which can help collect water usage data and prevent water damage. Meanwhile, about 14 million households will have a smart home controller, whether for security or entertainment, which could also include energy management features. Apple, Google and the rest of the consumer electronics giants are targeting this smart home ecosystem. While they’ve concentrated mainly on the wow factor, they’re also a natural coalescing point for data coming in that can help monitor home electricity use. As for market share, last month Comcast announced it’s approaching its 1 millionth customer for Xfinity Home, while ADT Pulse announced its 2 millionth customer. Still, the more ambitious efforts like Apple’s HomeKit, Google Assistant and Amazon Echo have remained in the realm of the earliest of adopters. 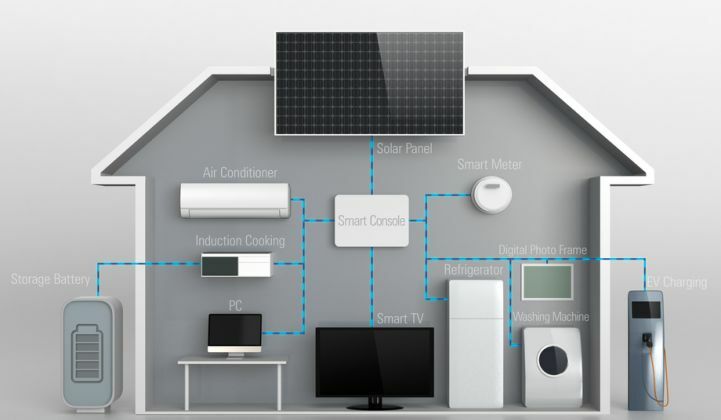 GTM Research’s Energy in the Connected Home 2015 report provided a snapshot of market developments at the time. Increasingly, “HEMS 1.0 technology” like direct load control and thermostat programs is being outpaced by bundled residential services from major corporates and startups offering services beyond energy management. The report identifies more than 40 vendors in the U.S. market, including home improvement stores like Lowe’s, home security providers like ADT, cable companies such as Comcast, and a bevy of startups with software or hardware that fits into the ecosystem. Many work together, and many have been acquired at one time or another -- Comcast and Alarm.com agreed to acquire and divvy up long-time home automation platform startup iControl.